Welcome to The Roller Skate Dad Podcast – Episode 1! I created this show to have a place where we can discuss everything in the world of roller skating. Today, there are not many podcasts or even websites that talk about roller skating. The ones that do exist are rarely updated and don’t come often with objective, deep research on this great sport and hobby. I plan to change all of that. You see, I am on a mission with this podcast and the corresponding blog here at RollerSkateDad.com. It’s a simple mission: to get more people roller skating and to have fun while doing it! Skating has been a passion of mine ever since I was a little kid. I started skating around my neighborhood and in my parent’s home when I was 8 years old…and I just keep skating. It’s so much fun! In this first episode, I talk about my roller skating background – as a competitive artistic freestyle skater, DJ and floor guard growing up. Then, I give you a rundown of everything we are going to be covering in future episodes of the podcast. And last and most important – You just love to roller skate for fun! Jeff Stone: Hey everybody. Welcome to the Roller Skate Dad podcast. This is our first episode. Episode number one. Numero uno. Let’s get started. Announcer: Welcome to the Roller Skate Dad podcast. The show that covers everything and anything in the wonderful world of roller skating. Now, here’s your host, the Roller Skate Dad himself, Jeff Stone. Jeff Stone: All right, everyone. Wanted to welcome you to the Roller Skate Dad podcast. This is the first episode. I want to thank all of you for being here and for listening and being the first episode, I wanted to tell you a little bit about what the Roller Skate Dad podcast is really going to be all about. Jeff Stone: Obviously, the most important thing that we’re going to be talking about on this podcast is roller skating. That’s why it’s called Roller Skate Dad podcast. It’s about rollerskating and I have a lot to say about the subject. I grew up skating. I am a past floor guard / DJ at Forum Roller World in Arlington, Texas. That was like 30 years ago. I was the DJ there and the floor guard. Of course back then, you were really supposed to be a floor guard. DJ was really your second job, but every DJ, any DJ, always believes that DJ’ing was their first job at a rollerskating rink. Floor guard was, you know, maybe a second or third job duty on the list. Jeff Stone: So I was a floor guard and a DJ for, I’d say about four or five years in my teenage years. Started when I was about 12 and went until I was about 17 or so and I also, during that period of time, was an artistic figure skater. Yes, an artistic figure skater. They exist on roller skates. And I was also a junior Olympic national champion in artistic freestyle rollerskating. This is very similar to what you see on ice skates today, spinning, jumping, those kind of things. It still exists today. It’s very small. There’s not nearly as many people, doing artistic figure skating as there used to be, but the sport is still there. Jeff Stone: Also, recently, after about a 15 year hiatus from skating, I got back into it. So I would say probably from my 20s until my early 30s, I didn’t really skate. And then my two daughters came along. I have two teenage daughters, Lily and Violet. Hi, Violet. Violet: Hi, how you doing? Howdy. Jeff Stone: Lily is 16 and Violet is 15 and when they were both pretty young, I’d say when Lily was about five, we started roller skating. I started taking her to the rink and started teaching her how to roller skate and they both are really avid skaters now. I would say probably about 10 years ago, we really started picking skating back up as they started skating and so I really started picking skating back up, because well, it’s just fun, and that’s the reason why we do it. Jeff Stone: So what’s the Roller Skate Dad podcast going to be all about? The Roller Skate Dad podcast is really to try to bring a voice to roller skating that I feel isn’t out there today and I really love this sport and I really love to roller skate. I want other people to find it as well. I want other people to find roller skating. I want other people to love roller skating and so my mission, with this podcast and the accompanying website that I just recently put up, is to get people excited about roller skating and to keep it going and to keep more and more people getting out there and just jamming and having a good time. That’s what this is all about. Jeff Stone: So we’re going to talk about all kinds of different things in the wonderful world of roller skating. We’re going to talk about all the different kinds of roller skating. Speed skating, artistic skating, jam skating, roller derby, roller hockey. We’re going to talk about all of these sports. They really are sports. They’re all separate little types, niches of roller skating that are out there, just in artistic skating alone there’s three different types of skating. There’s dance skating. That’s where you usually dance, either with yourself or with a partner, but it follows a choreographed set of steps to music. There’s freestyle, which is very similar to what you see in the Olympics today in ice skating, where people are doing axles and double axles and flips and loops and sow cows and camel spins and sit spins. Yes, I know a lot about artistic skating. Jeff Stone: Then there’s also figures. You’re probably like, figures? What is figures? Figures, for those of you not in the artistic skating scene, you may see them on some of the rink floors that you go to. If you go to a skating rink, you’ll see these circles that are on the floor. Often there’s three big circles in the middle of a rink and then there’s smaller circles within there. Figure skaters, actually where artistic figure skating comes from, figure skaters are actually people who trace those lines with their skate. So they actually start at the part where the circles meet, where two big circles meet. They put their foot there and then they actually trace that line going all the way around on one foot and you’re often judged by how well you do, how good that line stays right in the middle of your skate and there’s all kinds of rules and things that go around figures. Jeff Stone: We’re going to talk about all of that. We’re also going to be talking about how to pick out the best equipment for each type of skating. In episode number two, we’re going to be talking about roller skate wheels and how to pick out the best roller skate wheels for the types of skating that you might be doing. Got a lot of great tips for you in that episode. We’re going to talk about roller skate bearings. How do they work? Do I really need to change my roller skate bearings out all the time? How often should I change them out? How do I clean them? Is it a good thing to use oil on my roller skate bearings? Should I actually use water on them? No, don’t do that. Jeff Stone: Should I … You know, how do I clean them? What’s the perfect way to clean them? Is it worth cleaning them? Is there really that much difference in this roller skate bearing, you know, roller skate bearing A versus B? So there’s a ton of information out there, a lot of misinformation out there as well, and so I plan to talk a bit about how we pick the perfect roller skate bearing in a future episode. Jeff Stone: We’re going to be talking about why roller skating isn’t in the Olympics and the story and the backstory to how it almost was and why it’s not anymore being talked about and maybe what we could do to change that. We’re also going to talk about the health benefits of skating. There’s a ton of health benefits. I mean, the biggest one being I like to do it and I don’t like to work out. I don’t like to go running on a treadmill and I’m not a big weightlifting guy, but I do love to skate and when I’m skating, I don’t think that I’m exercising. I’m just having fun. Jeff Stone: We’re going to talk about the health benefits of skating and we’re really going to dig deep. I plan to bring on some nutritionists and exercise coaches and other people like that, that we can actually ask questions like this about, because I think if people really understood how good skating was for you, there would be more people doing it because it’s fun. You get to listen to music in most of the indoor rinks that you go to, and you get to connect with other people, which is a lot of what our culture is not doing today. We’re not connecting all the time. We’re connecting online, but we’re not connecting in person and that in person connection is really important. Jeff Stone: Some other topics that I’m going to be talking about with you are some tips on how to teach others how to roller skate. When I was a floor guard back at Forum Roller World in Grand Prairie, Texas, shout out, I actually … One of the things that I did was I taught people how to skate. We had lessons for beginners that was in the middle of Saturday afternoon, around 12:00 and they were usually for like an hour, two hours, and I was one of the teachers. So I used to teach beginners how to skate forwards, just how to stand up, how to cross over, how to skate backwards and then we would get into more advanced stuff like how to do spins and how do like a waltz jump and how to do a bunny hop and then eventually how to do loops and all kinds of artistic type skating, because the skating rink Forum, at the time when I skated there, it was primarily an artistic skating club. Jeff Stone: We’re going to talk about all of it. We’re going to talk about backwards skating. We’re going to talk about what the best ways are to teach your kid how to roller skate for the first time if they’re brand new to it. What should you do? What shouldn’t you do? And I can tell you, one of the things you shouldn’t do is go down to one of these skating rinks and buy one of these plastic playmates, something that helps your kid stand up. Right? No. That’s not what you should do. Can your kid walk? If the answer to that question is yes, then your kid can skate. It’s that simple, but we’ll go over that in a future episode. Jeff Stone: We’re going to talk about if you’re older like me, in your 40s, maybe you’ve never roller skated before. How do you get started? Can you get started? Is it safe to get started? We’re also going to talk about amazing roller skate music. I mean, I can’t play any of the music. You can get sued on podcasts unless you have lots and lots of money to pay licensing fees, but we can certainly talk about it. There are some amazing, especially in the ’60s, ’70s and even some in the ’80s, but mostly ’60s and ’70s, great rollerskating music out there. There’s still some today. There’s some new songs occasionally that come out, but I tend to be a little bit more old school, so we’re going to talk about rollerskating music a lot. Jeff Stone: Then I plan to do a ton of interviews with people from the skating industry. I’m going to be talking to US and world champion speed skaters and jam skaters and artistic and derby skaters. I’m also going to be talking to rink owners, so people who own skating rinks. You know, maybe talking to them a lot about what the business is like. What’s it like to own a skating rink? What’s the things that they struggle the most with? Are roller skating rinks profitable? Is it a good business model? If I decided I wanted to go open a roller skating rink in my local area, what should I do? How would I do that? Jeff Stone: We’re going to talk a lot to rink owners about what can happen to make skating more popular and to get more people out there skating, which is a big mission of this podcast. Jeff Stone: We’re also going to be talking to wheel, bearing and skate manufacturers and this is mainly just to discuss specifications of their products and to talk about new product lineups that they have coming. A lot of these folks are experts at what they make. They’re experts at making wheels. They’re experts at making bearings. So there’s nothing better than to talk to the manufacturer and actually ask them the kind of questions that we’re always wondering, like, “What’s this wheel best for? Is it good to skate outdoors in this kind of wheel? Does this durometer of 96A, is that okay to skate on asphalt?” Right? Different questions like that. Some of them may seem a bit juvenile, but there’s no better way to get an answer to something than to ask a question and there are no dumb questions, as they say, only stupid answers. Jeff Stone: We’re also going to be doing interviews with roller skating distributors, roller skating retailers. These are people who sell the products that you and I use and we’re going to ask them questions about which products do they think work? How do they determine what the best thing is to put on their feet? I’m also going to be talking to other roller skating podcasters out there. There’s a few of them that are out there, some of them that are here in the US. 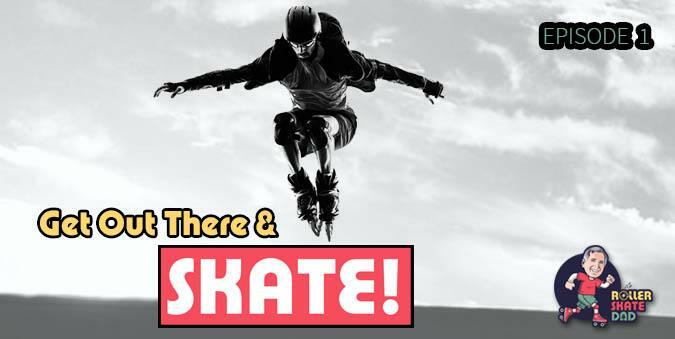 There’s actually some that are overseas and I’m really looking forward to getting those folks on the show and talking to them more about what got them to start creating podcasts about roller skating. You know, roller skating is a very action driven pastime and sport and so some may think, “Oh, creating a roller skating podcast seems kind of weird, because you know, you can’t see it. Videos make sense, but how do you just talk about roller skating?” I plan to prove that point of view wrong, because I think there’s a lot to think about when it comes to roller skating that a podcast works great for, but I can’t wait to bring on some of those folks, so that we can also talk to them and ask them that exact same question. Jeff Stone: We’re also going to talk about how roller skating got it’s start. Where did it come from? Who invested it? Where is it’s future going? We’re also going to be talking to skating historians and longtime skaters. I love talking to older skaters. Folks that have been skating, you know, they’re in their 70s or their 80s and they’ve been skating since they were 10. I just love to talk to people in that age range, because they have such a different take on what skating used to be like and they saw the ’60s and the ’70s, before I was born, sorry to those of you who may be older than me, who really saw skating in it’s heyday. Jeff Stone: I’m also going to be talking to people in the roller skating industry. These are associations. Places like USA Roller Sports and the Women’s Flat Track Derby Association and the Roller Skate Association International. These are places that sort of sanctioned sports and their associations for rink owners and so we’re going to talk to them about where they see the roller skating industry going. Do they feel like it’s regressing as we see some rinks close in certain urban populations or do they have different evidence? Do they believe the industry is actually growing and that it’s healthy? Jeff Stone: So it’s one thing for someone like me, who is just a roller skating enthusiast to say, “Oh, I think the roller skating industry needs help.” It’s another thing to actually talk to the associations who actually deal with the rink owners and who deal with the sports and to talk to them about what are their registration rates look like? How well is the sport doing? Do they need an influx of new people into the sport? Are they in trouble? Or are things going well? And tell that story. Jeff Stone: I’m also going to be talking to roller skating filmmakers and actors. Yes, there’s actually movies out there about roller skating. Xanadu, anyone? And even current stuff. There’s a brand new documentary coming out on HBO in February called United Skates and I’m going to be reaching out to people like that to talk more about their films. Besides interviews, I’m also going to be just talking about in general, like how do you become a better skater? How do you become a better jam skater? How do you become a better speed skater? A better artistic skater? Just a better skater in general? Better rink skater or derby skater? You know, a lot of that we’ll get from interviews from people that we talk to that are already good at what they do, but some of it is going to come just from experience and time together. Jeff Stone: Second, I’m on a mission to help keep roller skating fun and thriving and accessible to the masses. That’s the main purpose behind what I’m trying to do here. I’m trying to unite the roller skating communities together so that we can actually make roller skating here for the future, so that it can actually be alive and thriving and exciting for all of us so that the sports that we have don’t die. So that they don’t lose their popularity. We want to bring popularity to roller skating and make it a pastime and something that more people want to do. That’s my mission. I hope that you’ll join me in that. Jeff Stone: So it’s a lot of stuff that we’re going to be covering and there’s going to be much, much more. I know you guys are going to send me a ton of ideas for future podcasts and future blog posts, questions that you have, things that you’re struggling with. I really want to know about it. Like I said before, I may not have an answer for you. You may send me an email through the Ask Dad webpage and you may get a response in a day or two from me that says, “I don’t know the answer to that,” and if I don’t, I’ll say, “That’s probably a great question for one of these interviews that I’m going to be doing in the future.” So send me your questions. Even if you don’t think that I may be able to answer it, I’ll take my best crack at it. Jeff Stone: I’m doing tons and tons of research on the industry. I have a lot of past knowledge about the industry already and about the different kinds of products and what the right products are for the right type of skating that you’re trying to do, but there are going to be things that you guys are going to ask that I’m not going to know, right? I’m not the Grand Poobah and I know everything about anything in the world of roller skating, but I do know quite a bit and I know a lot more than a beginner does, so if you’re a beginner and you need help, I’m a great person to reach out to. If you’ve been skating for decades like me, you may have some questions that I do know the answer to, just like you may have the answers to some of the questions I have, which would be awesome to communicate back and forth. Jeff Stone: But you know, maybe neither one of us know the answer and if we don’t, that’s a great time for me to go hunt down an expert and that’s what I’m going to do for you. I’m going to go hunt down the experts and get them to talk and put them on the record so that you can actually hear them in their own words give you the answer to your question. That’s what my purpose is here. My purpose here is to help give the skaters that we have, that are in this club, a voice so that they can all be heard and that we can all hear the answers to these questions. So if you have a question, go to Ask Dad. Shoot it to me and I’ll be sure to cover it in a future podcast episode. Jeff Stone: I am super excited to bring the next episode to you. In episode number two, I’m going to be going over the Top 10 Tips for How to Buy the Perfect Roller Skate Wheels. This is a pretty popular post that’s on my website already. I’m going to be going over it in a lot more detail and giving you some more information behind it and giving you a few extra tips as well, that are not in the post that I thought I would share. So you’re going to want to definitely check that out. If you haven’t subscribed yet, it’s a great time to. If you’re in Apple Podcasts, Google Podcasts, Stitcher, go kick … Yeah, go kick that subscribe button. You’re going to hear these podcasts. They’re going to be coming out every week, so you’re going to want to be subscribed so you don’t miss anything. Jeff Stone: Another great way to stay in contact with me, head over to RollerSkateDad.com and over on the right hand side, you’ll see an area that says, “Join the Roller Skate Dad Club.” You’re going to want to go over there, punch in your name, punch in your email address, click the sign up button and you’re in. You’ll have access to additional emails from me about new tips and new techniques, things that are going on with the show, things that are going on with the website, things that are going on behind the scenes. You know, interviews that I’m doing before they air and you get some access to be able to actually say, “Hey, you’re going to interview that person? I’ve got this question. Can you ask them this question?” So, it’s a great way to stay in touch with me if you’re subscribed, because I send out extra emails to my club members and actually they get some extra access, basically, to the show as well as to me. Jeff Stone: So it’s real simple. All you need is your first name and your email address. I mean, can’t get much simpler than that. If you haven’t already, go to RollerSkateDad.com, join the skate club. Jeff Stone: All right, episode number one is in the books. I want to thank you guys so much for being here. I can’t wait to bring you episode two, so be sure to subscribe and most importantly, get out there and skate. Announcer: Thank you for listening to the Roller Skate Dad podcast at www.rollerskatedad.com. If you liked what you heard today, please be sure to subscribe, rate and review the podcast on Apple Podcasts, Spotify, Google or wherever you’re listening. I want to share my knowledge and passion for this great sport and hobby with all of you. And, I still have a lot to learn about skating, so I by no means have all of the answers. But, I do have a lot of questions, and so I plan to use my journalistic and broadcasting skills to hunt down the experts in this industry and bring answers to your frequently asked questions. I hope you will join me every week for a new episode of The Roller Skate Dad podcast. Please subscribe to the podcast and leave a comment below if this is a topic that is also important to you. Ask Dad – Ask me a question for a future show. Hi! Nice podcast. Thanks! Looking forward to the wheels podcast. I’ve learned a lot at this point about wheels and am now realizing how important they are in different settings. I love the idea for this podcast! I live in NJ but am in an awkward space to find lessons for me to learn new tricks without killing my self (I’m 37 and can’t afford to take time off of work for a skating injury). I’m looking forward to hearing about opening a skating rink, learning tricks, learning more about wheels, identifying good skate music, and so much more! I love that you have included your daughters on this mission. It’s great to show them they can do anything st any age! Thank you for sharing your first podcast and I look forward to hearing more about roller skating. New episodes roll out every Thursday. Listen to the Podcast Live here.